Trip presents an optimistic rebirth in their ongoing series of concept albums. happy new year! we wish you happiness! is the theme for this double 12” of carefully curated breakneck techno and IDM. The eight-track package is a fantastical celebration of the new – with three new artists joining трип and a fresh new visual outlook for the label – dropping early in the New Year. Continuing their mission to explore the inhospitable extremities of electronic music, happy new year! we wish you happiness! offers an otherworldly selection of rare sounds and abnormal structures from artists both familiar and unknown. Buttechno opens the album with a concise but disorienting measure of mutating acid for his first appearance on tрип, followed by ‘u ludei est pravo!’, a distorted swirl of uncanny acoustics from label boss Nina Kraviz and Snazzy, aka Dan Snazzelle of Nina’s favourite New York module makers Snazzy FX. трип regulars PTU grace the B-side with a sparse techno cut full of layered details and animated leads, whilst absolute newcomer Carlota fuses mind bending cross-rhythms and sonic oddities on ‘your destination’. Then for her second track, ‘noise psychosis’ follows malfunctioning computers as they scatter through an abandoned landscape. Closing off the C-side, the youngest addition to the tрип family Vladimir Dubyshkin marches with intent on glitching stomper ‘soviet film’. Buttechno’s second entry ‘dubstepping progression fast’ is a mass of high speed drums, groaning sonic inflections and unnerving distortions. For the closing, Marc Acardipane as The Mover returns to the label with ‘track 1’. 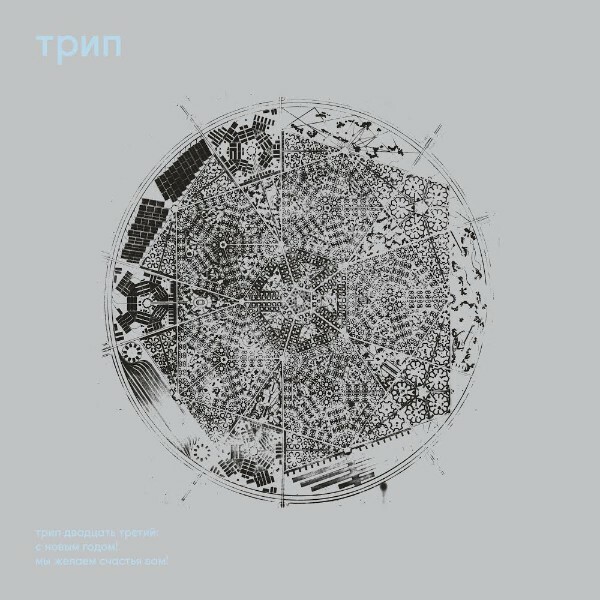 Eerie, conceptual and demanding, it’s everything трип stands for. трип 23 ushers in a new visual era for the label. In Russia, New Year is the most anticipated celebration, with lots of snow, joy and dreams. The intricate crystalline hexagonal snow-like drawings are actually detailed 60s soviet era architectural plans for a school that was never built. The drawings were shown to Nina by the creators grandson. The futuristic look of these “industrial snow flakes” are the perfect visual compliment to the musical theme of the album. happy new year! we wish you happiness! opens a welcome portal into further specimens of atypical electronic music and its multiplicitous manifestations, strange and sparkling in the darkness, like a dusting of snow over the city on the eve of the New Year. The final release on трип in 2018, will be трип 22 Vladimir Dubyshkin’s debut solo EP ‘cheerful pessimist’ on 17th December, a highly anticipated set of deep, swirling and vibrant techno tracks.